I wouldn’t dream of covering the history of the institution that is Buddy Guy. Suffice it to say that he is an award-laden bluesman, who celebrates his 83rd birthday on July 31st and we wish him well as he continues to play and record. Many artists would be fearful of trying to follow a Grammy-winning album such as Guy’s Born To Play Guitar album from 2016. Yet here he is, giving us 15 tracks of pure blues genius on his latest release aptly called The Blues Is Alive and Well. Such is his standing in the world of guitar and blues that he has Jeff Beck and Keith Richards playing alongside on one track. Mick Jagger and James Bay also put in appearances to cement the proof, should it be needed, that Buddy Guy is true Blues Royalty. Once again, Guy has worked closely with composer and producer extraordinaire, Tom Hambridge. Although many of the songs are written by him, he and Guy have the inextricable link that allows him to write from Guy’s perspective. That is why the lyrics are so believable, why they could so easily have come from the octogenarian’s own experiences. As Guy says, “(Hambridge) is the type of guy who feels what I’m gonna do. Even in my early Chess Records days, you had Willie Dixon… affiliated with those hit records, and this kid just has that feel too. He brought the songs in, and hopefully, we did a good job”. Well, I can tell you now Buddy, you most certainly have done a “good job”. Good value too, with 15 tracks giving you a running time of 65 minutes that take it from me, will fly by. I was totally sold within the first 15 seconds of the guitar introduction to the lead track, A Few Good Years. It is mesmerising and just gets better as the song progresses. Yes, it follows a classic blues structure, but it is so well executed from the Hammond and slide backfill, to the subtle playing of Guy, this is electric blues personified. His voice still makes the grade too and it is suitably filled with emotion to match these (and the other) lyrics. The tempo increases for Guilty As Charged and, again it is a classic formula, but the solo is worth the entrance fee on its own. The piano, drums and bass hit all the right notes too so that the familiar blues pattern can still sound new. Cognac is up next and it starts in a recognizable way, until the unmistakeable stinging guitar from the maestro, Jeff Beck, cuts in. For the solos, Guy name checks Beck and the genius of Keith Richards. This song is a ‘tribute’ to the golden drink Cognac and suggests that Muddy Waters was especially proficient at making bottles of the stuff disappear (although Guy pronounces it “Coney-ack”). I promise, if you like real guitar playing, this will be on repeat forever and a day, it is that good. 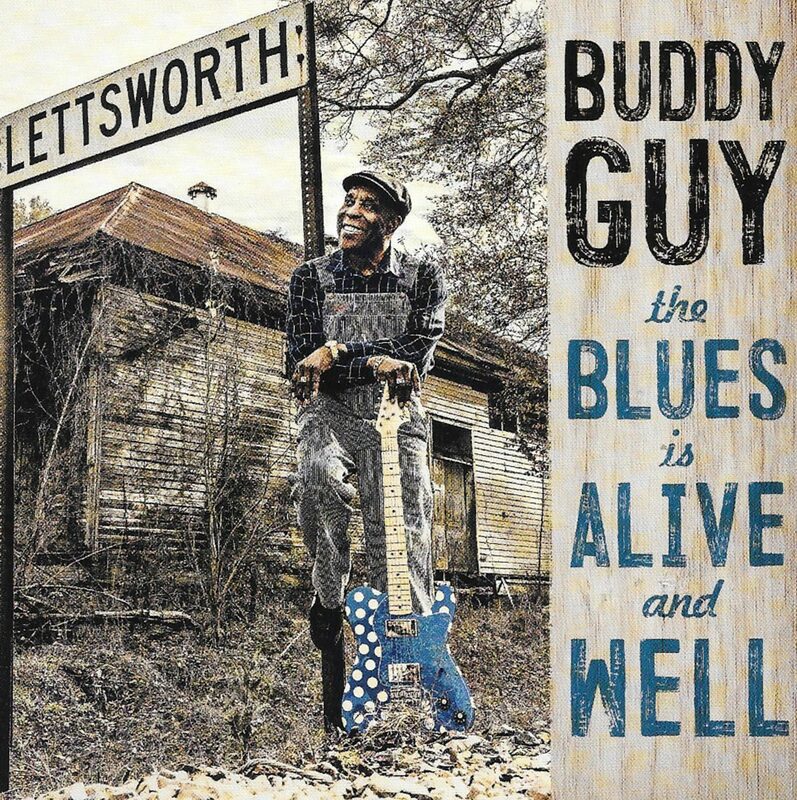 The title track embodies all of electric blues tropes, both lyrically and instrumentally, to prove that indeed, “As long as I’m around, The Blues Is Alive And Well”. The Muscle Shoals horns contribute restrained punctuation throughout. Once again the solo is liquid gold. Bad Day ticks all of the classic blues boxes but is so professionally carried out, it is almost like listening anew. Blue Day features British singer James Bay who, I confess I have never heard of even though he has supported The Stones and Taylor Swift (?!). Having checked him out on the interweb and heard him on this track, I will not be seeking out his work. He has the kind of voice which, I’m afraid just makes me cringe with his tendency to strangle every syllable. So, in my mind, this is a track that had a great deal of potential and is simply ruined: apologies to any Bay fans. Whiskey for Sale helps me forget that spoiler, as we get an opening picked riff which sounds very like Bowie’s Fashion before it reclaims its blues backbone. The slide work on this track is majestic and the McCrarys help the chorus along nicely. You Did The Crime is next up, and it begins with a slow drum/bass/piano intro, which lulls you before Guy’s guitar speaks. We then get the indomitable Mick Jagger showing he can play a mean gob-iron as well as sing (although he doesn’t sing on this appearance). The interplay between his harmonica and the guitar is perfection. Old Fashioned Guy is a horn-led blues romp as Guy regales us with the reasons why he is “Old Fashioned but still knows how to have fun”. When My Day Comes takes the tempo down with a gentle intro and Guy singing, “when I grow old mama, and my days are through…” I guess that mindset keeps him young and helps inform his emotion-filled vocals and just listen as he pulls the same emotions out of that polka dot Stratocaster. We travel back in time for the only cover on the album: the Sonny Boy Williamson II classic Nine Below Zero is transformed from a harmonica-laden song into a clever reworking with the guitar taking all of the parts. Ooh, Daddy takes us up-tempo with a jive feeling to the simple chord riff (or if Buddy weren’t 83, some might say it’s a bit Top like). I have a feeling the lyrics are mostly innuendo, but that could be my interpretation. Somebody Up There is another blues standard structure so beloved by so many but, yet again, it has enough passion and skill, that it is still brand new. End Of The Line seems to recognize Guy’s mortality although he “has one foot in the grave, I won’t be quiet and I won’t behave”… music to my ears Buddy! The final track is a sub one-minute recording of, I guess, Guy, having a bit of fun during the sessions. It’s called Milking Mutha For Ya and is about the risks of milking a bull instead of a cow…’nuff said. So, overall this album is a must-have in any blues collection: it doesn’t break new ground, each track has a familiar and comfortable structure and progression and yet… it’s sheer intelligence and interpretation brings a freshness to every track (bar one!). Guy’s guitar is still at a peak that is the envy of countless would be guitarists and knocks the shredders into a cocked hat. So I urge you to imbibe, use osmosis and revel in the skills of the band and the man. You will not be disappointed. Richard Fleming (one ‘m’) is a noted musician and composer who has also collaborated with Devon Allman, Mike Zito, Eddy Clearwater and Koko Taylor, to name but few. Gary Nicholson is a respected composer, producer and musician and he too has collaborated with artists such as Willie Nelson, Fleetwood Mac and Ringo Starr. Mac Davis is another musician, actor and composer linked, most famously, to Elvis as he wrote in The Ghetto amongst many others. Jamey Johnson is yet another respected musician and composer and has collaborated with everyone from Willie Nelson to Blackberry Smoke.